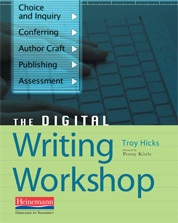 Next, on October 14th, Troy and another group of teachers who are featured in his book will discuss the process of conferring and response to student writers as they create digital texts. Teachers Teaching Teachers #157 - 06.24.09 - (3 of 3) Teaching the New Writing - Kevin, Bryan, Marva, Troy, and Dawn mix it up! On this podcast, our guest host, Kevin Hodgson helped to wrap up the third episode of a Teachers Teaching Teachers 3-part series that centerd on the book Kevin helped to edit (and contributed a chapter to) called Teaching the New Writing: Technology, Change and Assessment in the 21st Century Classroom. On June 10, TTT hosts Paul Allison and Susan Ettenheim interviewed the editors about the project, which looks at changes in the writing classroom through the lens of technology and assessment. (listen to the podcast of that show over at TTT#155). In the second show in this series, on June 17, TTT156, Paul turned the host reins over to Kevin as he chatted with some of the chapter writers about the concept of collaboration in the technology-infused classroom. In this podcast, as Kevin once again graciously agreed to host the show, we looked at the concept of audience and technology is opening up new doors for publication and expanding audiences and what that does to writing in the classroom. This podcast is the third of three Teachers Teaching Teachers shows in June that focused on this book. On TTT#155 (June 10) we had the editors of the book. Next for TTT#156 (June 17), we had authors from the different chapters of Teaching the New Writing on the show.